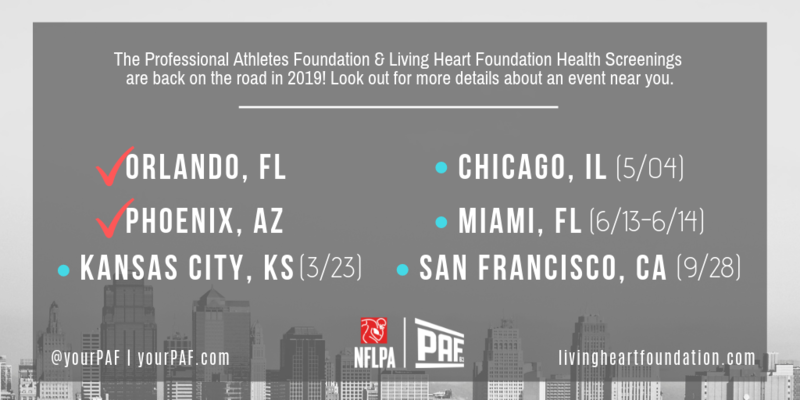 Since 2003, the Living Heart Foundation (LHF) has been providing former players with heart and comprehensive health screenings in an effort to educate players about the risks of cardiovascular disease and obesity. Through the generation of awareness throughout the former player community, the LHF has identified risks in countless players and ultimately saved lives. Their comprehensive database has allowed the LHF to develop proper education and lifestyle programs that are catered specifically to former players. Through yearly screenings across the country, the LHF is dedicated to serving as many former players as possible to provide them with the knowledge to live their healthiest. The LHF was established by retired cardiac surgeon, and former NFL player, Arthur J. Roberts, M.D. in April 2001 to combat sudden cardiac death and to provide risk stratification with early intervention for cardiac, pulmonary, and metabolic conditions through on-site screening and integrated health programs. LHF is dedicated to providing these services specifically to groups that traditionally have been overlooked, especially high school, collegiate and professional athletes.